Interviewing is one of the fundamental skills required of almost every public and private sector investigator. Brandon Perron, CCDI, is a General in our profession. He is known to many of us as a devoted criminal defense investigator, founder of the Criminal Defense Investigation Training Council and the coveted Certified Criminal Defense Investigator professional designation. Although his life has been devoted to defense investigation skills, these are all adapted to any of the other areas of investigations – from civil to workers compensation, and including law enforcement. “Forensic Testimonial Evidence Recovery – The FTER Method” is described as the art and science of the interview. This is Brandon’s second investigative book; his first is “Uncovering Reasonable Doubt: The Component Method.” Although it is not necessary to have studied and read the first book for the benefit of the FTER Method, it is highly recommended as the two complement each other. The two are based on the same fundamental evidentiary issues necessary for criminal defense, justifying about 1/3 of this book devoted to those concepts. The book opens with reminding the reader that as investigators, we are truth seekers as an ultimate goal. Achieving that goal, through the investigative process, often relies greatly on the skills of the investigator as an interviewer. The investigator pursues evidence, truth and facts. This book consists of 13 chapters that progressively and logically follow a series of informative steps to an in-depth explanation, study and application of the FTER Method. This book was written for all investigators – from the novice to the experienced. Those areas for the novice remind the experienced, and those written for the experienced prepare the novice. This is done through three basic areas of the book – evidence and fundamental concepts, application of the concepts, and advanced techniques. Brandon takes the investigator through the understanding of evidence, fact finding and recovery of evidence. This is a process and it is important to understand what evidence is and how it is admitted as evidence by the court. Knowing this process is fundamental to being able to investigate and conduct interviews, that successfully elicit evidentiary information. The FTER Method takes the evidentiary process further in defining testimonial evidence. As pointed out, testimonial evidence is often forgotten or overlooked, which is a detriment to the investigative process. The successful investigator knows, or will learn, the value of testimonial evidence and the interview methodologies necessary to conduct and complete successful forensic interviews. The novice is briefly introduced to The Component Method as part of the fluid and dynamic investigative process. Having a defined and consistent investigative methodology is necessary to assuring that all investigations leave no stone unturned – this book demonstrates the interview skills necessary, and how to apply those skills. Leaders of the investigative profession may have different methodologies, but they all share the same purpose and fundamentals. That further makes this book a practical adaptation to all manners of investigations and methodologies. This is where the challenge of the book and FTER method begins. The reader is challenged to learn, adapt and apply the concepts – including with practical mini-tests throughout each chapter. In the process of interviewing, the investigator is an astute observer making inquiries to assess the facts leading to the truth. Brandon clearly defines the history and purpose of the interview, and its application to the law and judicial process. This is what begins to define the forensic interview. He defines the personal and professional influences, personal perspectives and professional perspectives experienced by the investigator. The understanding of the influences and perspectives as they relate to the interview also guide the techniques used. Brandon details how to maneuver through these influences in the interview preparation and actual interview process. The job of the investigator is professional, and therefore only considerations of professional, legal and ethical exist; we must set aside any personal morality. Is the interview an art or science? Brandon reminds us that it is both, and subject to those personal and professional influences. However, because interviews are fluid and dynamic, there is no method of scientific testing or validation. He further reminds us of the difference between the interview and interrogation; including their purpose, application and what defines them legally. This book and the concepts of FTER aid the investigator in avoiding confrontational and accusatory interviews. Understanding that the interview is as much art as science is the premise of this book. The interview is to obtain evidence (Recovery) in the adversarial judicial system – Forensic application. Interviews are Testimonial. Therefore, Forensic Testimonial Evidence Recovery. This is a strong concept, that when appropriately applied, is a powerful technique. When applied consistently as part of an overall investigative methodology, it strengthens any criminal defense investigation and strategy. Combined, the concepts of Brandon’s Component Method and FTER Method will Uncover Reasonable Doubt. Critical thinking and deductive reasoning are vital to the investigator and the evidence recovery process – including the forensic interview. As fact finders – truth seekers – this is the underlying purpose of the interview. Without the interview, a critical component of the investigative process, and related evidence, is lost. This process begins with the review of the provided discovery, other investigative information and concluding with truth assessment. To fully apply these investigative principles the investigator must understand the moral and malicious anatomy of the lie – and how the same applies to why a person would tell the truth. Is it to spare a person’s feelings or avoid punishment? Perhaps to see someone punished for an unrelated event, retribution? Brandon presents various scenarios of applying the FTER Method to the concepts of assessing the truth. Brandon details this importance by presenting this decades old tried and true methodology. This is from review to question preparation, and then the forensic interview stage of evidence recovery. It is important to pay close attention to how Brandon describes, demonstrates and imparts the application of this FTER Method before continuing the book and learning process. The basic interview techniques are necessary to conduct effective fact-finding and truth verification interviews. He takes it to the next level for the experienced investigator in the stages of the advanced interviewing techniques. In one book Brandon covers the fundamentals and foundations, as well as the techniques and application, with the opportunity for the investigator to learn and apply advanced skills. The advanced skills include visual imagery, Kinesics techniques, and how the basic interview is further assessed and advanced using these techniques. One key task that Brandon reminds the investigator to not, at any cost or purpose, skip or overlook is the interview of the defendant. It is simply not possible to conduct any investigation or develop any legal strategy without the investigator conducting an interview – separate from any intake interview the attorney may have had. Brandon explains how the defendant interview is a foundation to the remainder of the investigative and testimonial evidence recovery process. This empirical information is vital to demonstrating reasonable doubt to any element of any charge presented against the defendant. In 13 chapters and a summary, renowned and respected Brandon Perron, CCDI, takes the criminal defense investigator down a road that is not well traveled but should be. 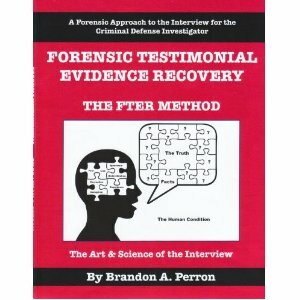 He maps out the concepts of the FTER Method, demonstrating and imparting the art and science of the forensic interview and related testimonial evidence recovery. To no surprise, Brandon bridges the art and science in a clear and concise methodology and plan of action. He packs a lot of punch in this book in the fight to assure every defendant is able to exercise their Constitutional right to an adequate defense. As a stand-alone book, the FTER Method is excellent. With its predecessor, “Uncovering Reasonable Doubt: The Component Method”, it is a powerful testament to the skills and necessity of a criminal defense investigator and how they can and will succeed in the most important role of our adversarial judicial system. Dean A. Beers, CLI, CCDI is a Certified Legal Investigator and Certified Criminal Defense Investigator. He is a published author and has lectured extensively and authored multiple articles, peer-reviewed white papers, including Practical Methods for Legal Investigations: Concepts and Protocols in Civil and Criminal Cases, released by CRC Press in February 2011, and previously Professional Investigations: Individual Locates, Backgrounds and Assets & Liabilities. Mr. Beers a member and Forensic Investigations Advisor of the Criminal Defense Investigation Training Council. He began his investigative career in 1987 and operates Associates in Forensic Investigations LLC, with his wife, Karen, also a CCDI. They have two daughters, a granddaughter and identical twin grandsons.